Having power failures at home or at your business can be very frustrating. So is having trouble with an electrical system or being unable to decide what electrical installation works best for you. No matter what your electrical problem is, won’t you rather have the best electrician in Singapore at your service? Daylight Electrician was established to provide reliable electrician services to you wherever you need it. Whether it’s a power failure, power trip or electrical wiring, we will help you with end-to-end electrical services that goes beyond just the issue. We make sure that we recommend solutions that are affordable and covered by our 30-day service warranty. We are respected among our competition because we are EMA licensed electricians in Singapore. Not every electrician can boast of certification by the Energy Market Authority (EMA). We have earned our electrical license and certification through our consistent delivery of quality results, high standard of professionalism and we are equipped with the latest tools and electrical equipment to provide accurate diagnosis of your electric problem and provide permanent, high-quality solutions that will give you peace of mind for years to come. Every customer inquiry to our office through any of our contact channels will be returned. We strive to always be there for your electrical emergency needs. 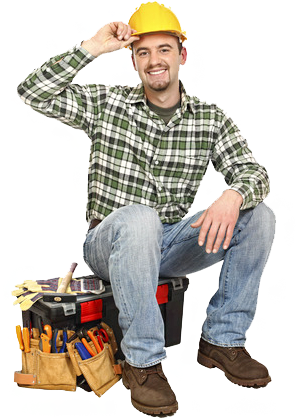 Daylight Electrician is committed to providing you with fast, reliable and affordable prices. No hidden charges, you sign off on any expenses before it is incurred and we also ensure that we only use OEM parts for all electrical installations. When you call us to help you with your electrical problems, we take our time to diagnose what the root cause is. We then provide you a transparent estimate with a breakdown of everything involved. There are no hidden charges, no extras or follow-ups. What you see is what you get. We also provide a 30-day service warranty and a commitment to always use original parts for all your electrical installations. Daylight Electrician is a foremost provider of electrical services in Singapore. We are fast, dependable and offer comprehensive electrical solutions in Singapore that is backed by 30 days’ service warranty. We have a dedicated team of certified electricians that have the training and years of experience to tackle your biggest residential and commercial electrical projects. We provide excellent service that is timely and available to answer emergency calls from 9am to 9pm every day. Our service guarantee to all our clients is that we will deliver the best quality electrical service to you using skilled and professional electricians for you at a fair price and with the highest level of customer service. We strive to be your one-stop shop for all your residential and commercial electrical services at an unbeatable price and unparalleled customer service. Daylight Electrician is a company that is built on a commitment to delivering premium electrical services in Singapore to residential and commercial clients always. Not only are we professional in all our dealings, we excel at leaving our clients with confidence and peace of mind with the finished project. When it comes to installing new electrical systems, electrical panels or appliances that have complicated electrical wiring, call us today and you’ll be glad you did. and all other residential, commercial and industrial electrical services in Singapore. Call us today and you will be glad you did. 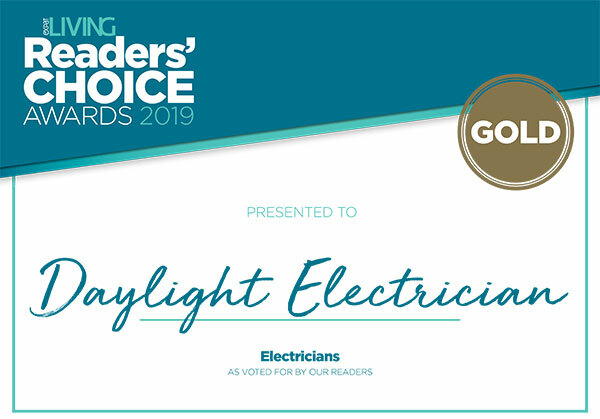 We are a proud recipient of the Gold award for Expat Living Singapore’s Readers’ Choice Awards 2019 under the Best Electricians category. Daylight Electrician Singapore provides complete electrical services including emergency electrician services. 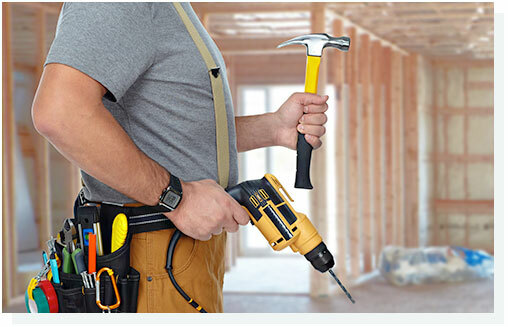 Our EMA Licensed electrician and electrical workers are EMA/BCA/IDA certifiied and specially trained to execute all kinds of electrical repairs and works including electrical installation such as light installation, ceiling fan installation, power failure recovery as well as electrical wiring and rewiring. We have over 20 years of electrician experience and have done thousands of electrical works for both residential (Landed, condo and HDB electrician) and commercial electrician. 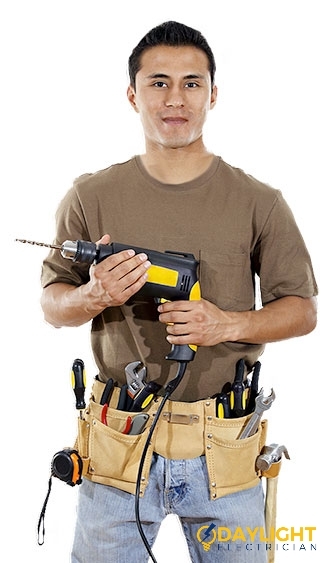 We are the highly recommended electrician in Singapore with many happy customers and reviews. Call us for guaranteed transparent and honest pricing for all your electrical needs at +65 6653 6261 or WhatsApp us at +65 8749 7490!